Our designers feel like elves in Santa’s Workshop this time of year. 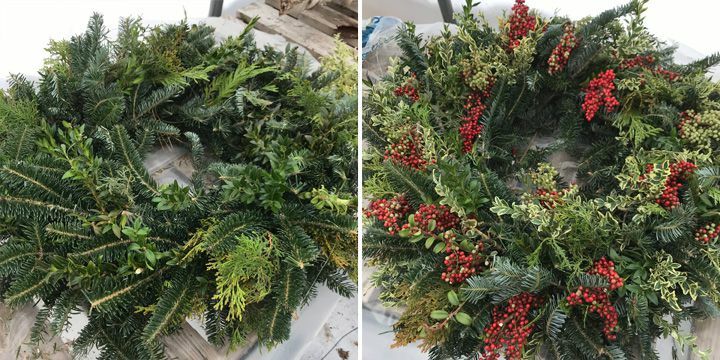 Each has their own station in the greenhouse and endless creativity for custom designed holiday containers, swags, décor, and wreaths. Some of our designers are on the move, filling orders on location. One of our elves, Candy, is in the shop sharing her recipe here for making your own holiday wreath. First, you will need the ingredients. We take pride in keeping you stocked with the freshest greens and fun décor. Come in and choose the look you want. We’ve found Fraser fir wreaths hold their needles best. Pick a size then decide what extras will make your design one of a kind. 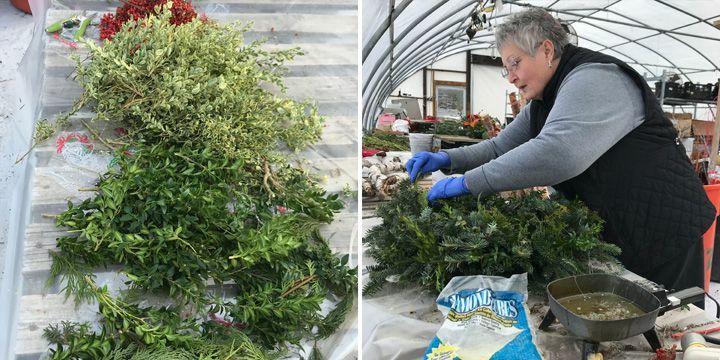 Candy has chosen a variety of greens, including arborvitae, variegated boxwood, incense cedar, Leyland cedar and red huck. Pepperberries add a pop of contrasting color against the foliage. Next, have your tools ready. Pruning shears will cut the foliage to size. A plastic zip tie becomes the hanger. Candy wears gloves when using hot glue to stick pieces in place. She melts super sticky glue pellets in a glue pot and applies the pieces by dabbing hot glue onto them with a stick. You may prefer to make small bundles and attach your add-on greens and décor with floral wire instead of hot gluing. Candy glues her add-ons onto the underside of the Fraser fir branches. She zig-zags them evenly around the wreath so the overall appearance is uniform and not clumpy. Layering a few different greens adds depth, variety, and character. “Pick the wreath up and shake it to see what’s loose before adding the pepperberries. Let it dry really well and get rid of the glue webs,” advises Candy. This wreath is naturally beautiful without a bow. Another idea in place of making a bow is to take ribbon and cut it into 3-inch pieces. Make a ‘V’ cut into the ends of each piece. Fold in the middle and glue the pieces around the wreath. If you want a bow and need help designing one, ask us. And if you run out of time to DIY, we have a ready-made assortment just waiting to be your curb appeal. Of course, as designers, we are happy to fill your custom requests. Happy holidays!